Weighing in at 523g (broadly comparable to a Brooks B17), the Selle Royale Becoz Moderate men's saddle is aimed at more relaxed bike ositions that angle the rider's spine at 60 degrees, placing considerably more pressure upon the sit bones. On cursory inspection this looks like another generously padded leisure orientated saddle but delve closer and it's bristling with high tech, shock absorbing recyclable technology. Yep, those short, steep steel rails might not set pulses racing but they're dependable, nicely finished and plug into a really clever bio-base. This combines recycled plant-based plastics with elastomer and foam elements derived from natural oils adding some discrete damping. Ah, but the wizardry doesn't stop here. Internally we've got 'Corkgel'- polyurethane gel blended with recycled cork. This clear goo is visible through a discrete centre strip in the wheat cover, which has a unique but not unpleasant texture fortified with FSC approved conifer shavings for additional purchase and recycled leather badges adding a colour coordinated finishing touch. Build quality is excellent throughout with neatly screwed construction (rather than simply bonded or stapled). Regular abrasion from rendered brickwork, trees, foliage and street furniture have made negligible impression. I'm suppopsed to fit a 143mm wide saddle, so you'll appreciate my initial scepticism having clapped eyes on the Becoz Moderate's 183mm base. There is an 'athletic' sibling some 19mm narrower, though its male-centric 283mm nose might alienate many women. Similarly, its tendency to position the rider further back may also present reach issues. Thankfully, ours coincided with my tubby tourer's adoption of moustache pattern bars and 20mm shorter stem but this still dictated moving the saddle further forward. Concerns it was too broad and would chafe, or otherwise hamper respectable cadences evaporated within the first few miles, while still offering ample support, regardless of shorts/insert. Changing position requires a lift 'n' shift, rather than shuffle 'n' slide technique. This became fairly intuitive given twenty odd miles, though thinner, budget shorts/inserts tended to gather uncomfortably as a result. Rains of biblical proportion had no impression, other than confirming that the cover iss fully water tight. Supportive padding and clever elastomers isolate light to moderate trail buzz handsomely too, delivering a subtle zing, allowing seated procession across washboard tarmac and moderate dirt roads. "BECOZ Moderate Man is designed for the Moderate riding position and belongs to a range of saddles developed by Selle Royal that places emphasis on ecologically sound elements of manufacture". There's also a woman's version. Well made with pleasing attention to detail. Surprisingly compatible with yours truly and my Univega rough stuff tourer. Well made and seemingly hardy thus far. Hardly svelte but not that far removed from traditional Brooks/pattern leather either. Not the most obvious choice for "serious" riding perhaps. Nonetheless, its proved surprisingly comfortable and durable thus far. Technology and ride comfort and definite talking points and its unusual nature has certainly grown on me. Nothing, although lighter rails would be nice and "lift n' shift" technique for adjusting position initially proved (mildly) annoying on club run typical distances. Did you enjoy using the product? Yes, pleasantly surprised. Would you consider buying the product? Yes but comparison with its leaner sibling would be useful. Would you recommend the product to a friend? I'd recommend taking a closer look for more upright touring/trail configurations. 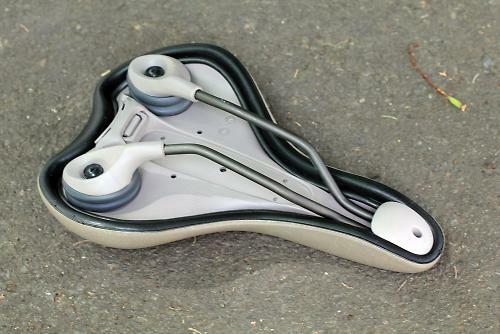 Having just bought the athletic model for my fold up bike (for a bargainous £12) I have to say it's a great saddle, really comfy, nice and non slip, which really helps with work trousers and jeans. As the review says, it does sit you back a bit further (which I wanted to stretch out the otherwise un-adjustable position) and it has pretty long saddle rails. I've bought one of the ICS compatible lights which is really handy too, and makes fitting extra lights really simple. If you can get one of the saddles in this range at a good price then I can't recommend them highly enough.